TOP > Event > HSP Seminar (#245)"'Syria Crisis' and the Findings of UN Commission of Inquiry: Prospect of International Prosecution"
It is seven years since the conflict started in Syria, shocking the world community for the brutality suffered by the civilian population combined with the persistent inaction by powerful States. In Japan, the media reports on the conflict itself, but it is often not discussed further. The focus of the Japanese media and public is on the humanitarian condition and aid. 1. To provide facts about the kinds and extent of violence that has happened in Syria. 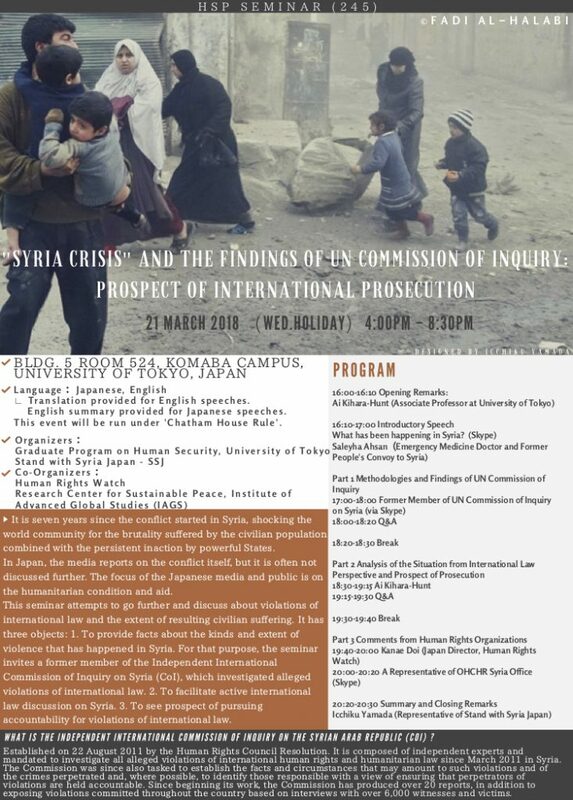 For that purpose, the seminar invites a former member of the Independent International Commission of Inquiry on Syria (CoI), which investigated alleged violations of international law. 2. To facilitate active international law discussion on Syria. 3. To see prospect of pursuing accountability for violations of international law. * This event will be run under ‘Chatham House Rule’.